The new year is finally here and well, it is not so new any more. I see resolutions breaking, old habits reverberating and life is back to the grind. As for me, for years I have resisted this whole thing of making resolutions for they are always meant to be broken. I have seen very few who actually manage to stick to their resolutions and P is one of them. 6 resolutions last year and all 6 carried out and he has 6 more this year. Some how 6 seems works to him. I for one have never been able to see through one resolution, let alone 6. But there are times when I think I could work on certain aspects of my life, I mean I am not making any promises but there is certainly room for improvement and it is worth a try. I like solitude, solitude works well for me, do not get me wrong I am anything but unsocial, I grew up as the only child and while my parents were very loving , I never had any one of my age group to share my childhood and as a result, I learnt to find company with my self and frankly, began to like it. But all these years there is one thing that has got me thinking, I have never really made full use solitude, I mean I do the usual things, music, reading, cooking etc but what more could I do, this is when I started blogging and I was pretty regular till work got in the way followed by travel, relocation. I could go on rambling excuses, the fact of the matter is that I did not try hard and that is what I would like to work upon. Writing is a very solitary thing, and very mood oriented. I do not know how many people actually read the things I write, given that I am neither eminently famous nor am I from the literary world. Nonetheless, writing I feel is one of the best solitary activities, you can do. The other thing is reading. Calling my self a bookworm would be an understatement, I am an addict and there is nothing more painful to me than not able to read or rather, not able to make time to read. The last year was so busy work wise I managed to hardly read anything, let alone books. I once remember reading some where “if you do not have time to read, then you do not time to write.” I am am ashamed to admit that last year I almost forgot to write. 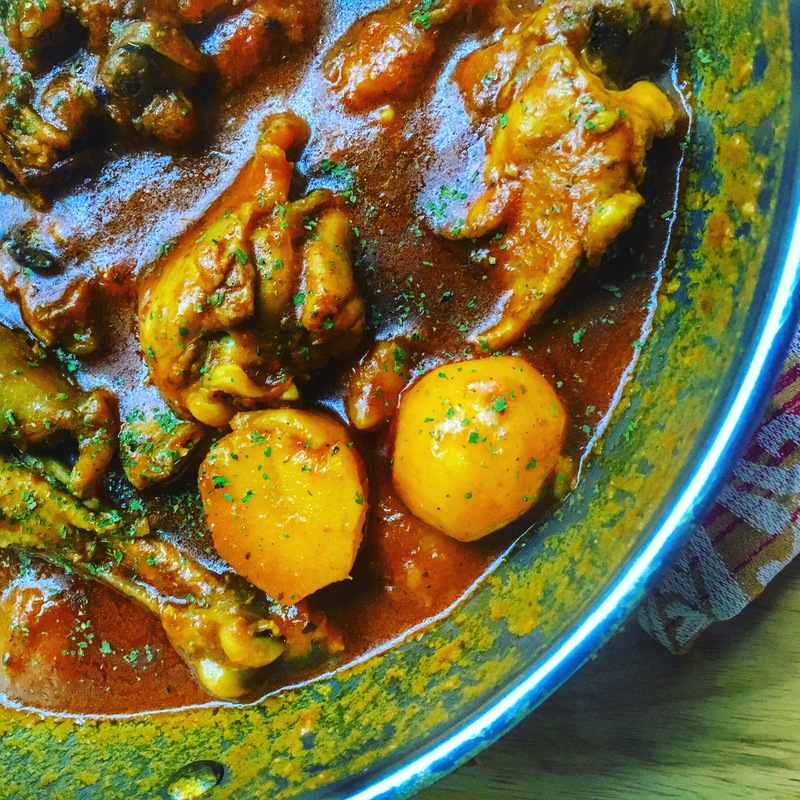 Coming back to writing, blogging has put me in touch and helped me to discover some amazing people who put in a lot of effort to cook, click and blog their creations and those days when I am completely at a loss as to what am I to cook for dinner, the virtual world comes as a savior. 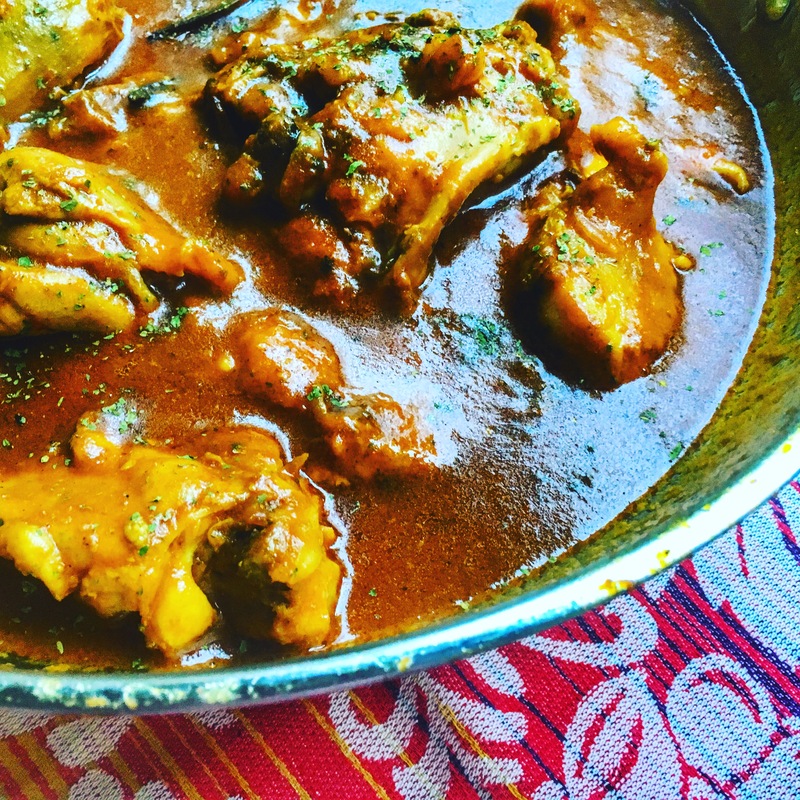 Whether it is Pritha Sen, Sinfully Spicy or Ecurry, Bongmomcookbook, Sikandalous cuisine, Monsoonspice, IndianSimmer, The Kitchn, and many more, they inspire me to cook and discover ingredients in a whole new way. This is exactly what happened a few days back. I was to have a few guests over for dinner and while I havd worked out a tentative menu, I was completely at a loss for a chicken dish. I was tired of the usual recipes and I needed something new , yet comforting for I was cooking for two single people who off late haven’t got much home cooked food. That is when the virtual world came to my rescue. 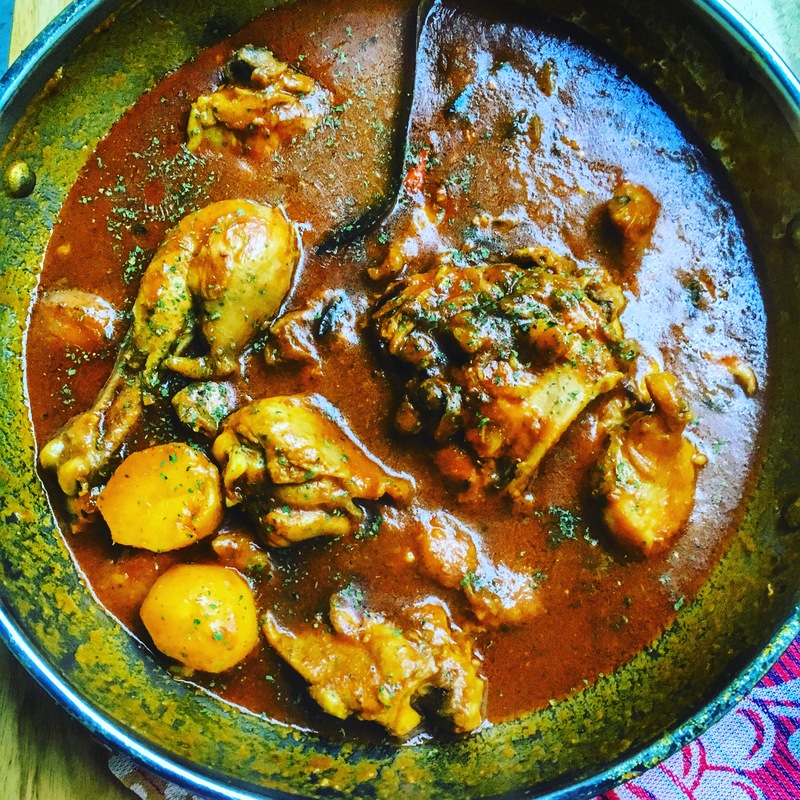 I stumbled upon this beautiful recipe by Sandeepa Di of BongMom Cook book and the best part about this dish is that it was very familiar to me, full of childhood memories and Kolkata winters. It was Picnic murgi or chicken cooked in picnics. Now let me tell you something, Bengali picnics are unlike others. We do not carry sandwiches or parathas, we cook our food on the spot. A whole entourage of cooks and helpers would arrive at the picnic spot/location early on in the day, make preparations and cook everything fresh on the location. .We have few picnic staples…rice , beguni, dal , mutton or chicken curry and fish fry. So as a child these picnics were a part of our yearly winter outings and picnic murgi would always be on the list. Except it never occur to me that I should try and cook this flavourful dish. Until I came across Sandeepa di’s recipe that is. I haven’t played around with the ingredients and the recipe that I post below are her words exactly. Chicken ~ 2lb. I had 5 medium thighs and 5 medium legs. Weighed little less than a kilogram. Onions 1 large sliced ( half moon) – Here the onions are large so that would equal to 4 onions back home. Marinate chicken with ingredients mentioned under marinade and leave it for a couple of hours at least. I left it for about half of a day. You can add potato halves into the marinade as well. Next take about 3 table spoons of mustard oil and get it smoking hot and then temper the oil with the whole spices. Once they start imparting the flavours, add the tomato puree, you can grate the whole tomatoes, if you like the course texture for the curry. I also added the ketchup as suggested in the original recipe. Saute for 2 minutes and then add the marinated chicken along with the potato and onion. Toss everything together at high heat for 2-3 minutes. Cook the chicken with frequent stirring at medium high heat for about 10 minutes. Now lower the heat, add all the ingredients under sauce and mix well. Once the chicken is done, r taste the gravy. Adjust for any spices as per taste. P.S. I have used fried onion paste to marinate the chicken. I usually deep fry them and then grind them into a fine paste and store them in an airtight container in the refrigerator. Just makes things easier. But you can use fresh onion paste as well. Do make a note that fresh paste tends to get bitter at times.